HTML 5 is a very hyped technology, but with good reason. It promises to be a technological tipping point to bring desktop application capabilities to the browser. As promising as it is for traditional browsers, it has even more potential for mobile browsers. Even better, the most popular mobile browsers have already adopted and implemented many significant parts of the HTML 5 specification. In this five-part series, you will take a closer look at several of those new technologies that are part of HTML 5 and can have a huge impact on mobile Web application development. In each part, you will develop a working mobile Web application showcasing an HTML 5 feature that you can use on modern mobile Web browsers like the ones found on the iPhone and Android-based devices. For this article, it is highly recommended that you have Mozilla Firefox 3.5+, as it is a desktop browser that supports geolocation. Of course you must test on mobile browsers too, so you will want the latest iPhone and Android SDKs for those. In this article, I used iPhone SDK 3.1.3 and Android SDK 2.1, but you should download and use the latest versions available or still supported. Offline Web applications are attractive to both users and developers for a number of reasons. Many developers would love to be able to write a single Web application that works on all of the most popular smartphones instead of writing native applications for each platform. Just because that would be convenient to developers does not mean that it would be desired by users. For that to happen, mobile Web applications have to be able to provide many (or most) of the same features that native mobile applications can provide. Working offline is definitely one of those features. Some applications will rely heavily on data and services from the Internet—whether or not they are a mobile Web or native application. For these applications, it is understood that functionality might be reduced if the user does not have a good connection to the Internet. However, the application cannot fail completely just because the user’s connection is not good. With a traditional Web application that is exactly what would happen. With offline applications, you are assured that everything is cached. Browsers will always load everything from cache, though you also get control over what should not be served from cache. It is a common Ajax hack to add an extra timestamp parameter to Ajax GET requests (or even worse to use POST when GET is appropriate) to avoid browsers caching a response. You won’t need this hack for offline-enabled Web applications. One key file is involved: the cache manifest for your application. This file tells the browser exactly what to cache (and, optionally, what not to cache.) This becomes the source of truth for your application. Listing 1 shows an example of a simple cache manifest. There is one more missing piece to enabling offline caching of your Web application. The Web browser needs to know that you want to enable caching and where to find your cache manifest file. Listing 3 shows this very easy way. The most important aspect of this HTML is the root html element. Notice that it has an attribute called manifest. This what tells the browser that this Web page can function offline. The value of the manifest parameter is the URL to the Web page’s cache manifest file. Again, this can be a full URL, though in this case it is a relative (to the given Web page) URL. The other thing to note here is the DOCTYPE for the page. This is the canonical doctype for HTML 5 Web pages. The offline Web application specification does not dictate that you use this DOCTYPE; however, it is recommended that you do. Otherwise, some browsers might not recognize the page as an HTML 5 page and might ignore the cache manifest. The rest of the HTML is just a simple example of using iUI. Figure 1 shows what this page looks like on the iPhone simulator. Testing an offline application can be a little tricky. If you can, the easiest way to do it is to deploy your application to a Web server. Then you can access the page once, turn off your Internet connection, and try to access it again. If anything fails, then you might have left out some files in the cache manifest. Before you give this a try, you will need to do one critical piece of configuration to your Web server. Listing 3 showed that you indicate the location of your cache manifest by using the manifest attribute on the root html element of your Web page. However, the specification for cache manifests dictates that the browser must do an additional validation step when it downloads and processes a cache manifest. It must check the MIME type of the cache manifest, and that type must be text/cache-manifest. This usually means that you need to configure your Web server to set this MIME type for a static file, or you must write some code to dynamically create the file and set the MIME type. The former is definitely the more efficient way to do things, but sometimes you need to do the latter if you do not have control over the server configuration (such as a server in a shared or hosted environment). If you control the server and if you are using a Java™ application server, you can configure this as part of the web.xml file of Web application. Listing 4 shows an example of this. The key section here is obviously the mime-mapping element. In this case you are saying that for any files that end with the .mf extension, give them a MIME type of text/cache-manifest. Of course, it is even more efficient to serve such files from a server that is dedicated to serving static content such as an Apache Web server. In a typical Apache installation, you will just need to modify the mime.types file in the httpd/conf directory as in Listing 5. #is important so they know how to handle the content of the file. In both examples, you use mf for the extension of your manifest file, since that file was manifest.mf. This is entirely arbitrary. You can make it .manifest or .foo, as long as the extension of the manifest file matches the extension used in the mapping in your configuration file. Note that other application and Web servers can have different configuration mechanisms. Now that you have seen the essential ingredients in creating offline mobile Web applications using HTML 5, look at a more complicated example to explore more of the capabilities of offline mobile Web applications. In the previous example, all of the content was static. It was nice to be able to see everything in offline mode. A more typical application needs to read dynamic data from its server and Web services. To make your example more realistic, pull in some data from Twitter. If you have read the previous articles in this series, then this will be familiar to you (see Related topics). To start, look at your modified HTML for this example in Listing 6. 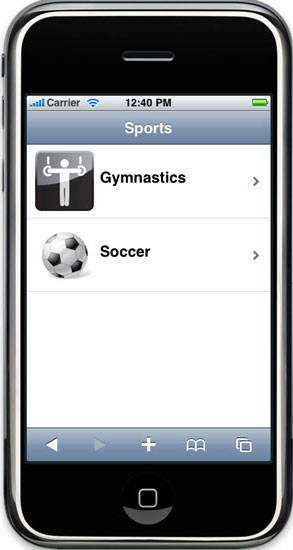 The main difference is that the gym and soccer elements are now lists, and are empty. You will fill them with tweets from Twitter on gymnastics and soccer, respectively. Notice also a list item element with id online that shows an image that will be used to indicate to the user whether the application is online or offline. However, this element is hidden by default, or, the default mode is offline. The body element specifies an init function is to be called once the body loads. Listing 7 shows this function. The first thing that this code does is check to see if you are online or offline. If you are online, then it displays the online image. Even more importantly, if you are online then data is loaded from Twitter by calling the searchTwitter function. Again, this is a technique (explained in previous articles in this series—see Related topics) that lets you search Twitter directly from the browser using JSONP. Next, you attempt to load existing tweets from localStorage. If you are familiar with localStorage, this is another HTML 5 capability that works quite well with offline mode. Check out Part 2 in this series to learn more about it (see Related topics). Notice for both new searches (kicked off if you detect that you are online) and for the loading of locally saved tweets, the showGymTweets and showSoccerTweets functions are invoked. These are similar functions, and Listing 8 shows showGymTweets. This function can display locally saved tweets, new tweets from Twitter, or a combination of both, if both exist. Most importantly, it saves everything locally, building your local data cache of tweets. This is all typical code for managing both locally cached data, and live data from the servers. It allows for the application to operate smoothly whether it is online or offline. Going back to Listing 7, the last thing you do is register event handlers. You are registering for online and offline events. This will tell you when the online or offline status of the browser changes. At the very least you can change the online image, toggling if it is displayed or not. In the case that the application comes online after being offline, you access the applicationCache object. This is an object representing all of the resources being cached as declared in the cache manifest. In this case, you call its update method. This method tells the browser to check whether it detects an update to the applicationCache. As mentioned earlier, the browser first checks for an update to the cache manifest file. You add another event listener to check for an update to the cache available. If so, then you call the swapCache method on applicationCache. This will re-load all of the files specified in the cache manifest file. Speaking of the cache manifest file, you need one final touch for this advanced example. The cache manifest file needs to be modified as in Listing 9. In this example, you have added an explicit CACHE section to the manifest. The manifest can have different sections, but if it only has one, then it is assumed to be CACHE and can be omitted. The reason that you were explicit here is that you also have a NETWORK section. This indicates to the browser that anything coming from the domain specified (in this case search.twitter.com) should be fetched from the network and never cached. Since you are locally caching search results from Twitter, you certainly do not want the browser to do any more indirect caching of queries. Now, with this in place, the application will always load live tweets from Twitter, but it will also store those tweets and make them available to the user even when the user’s device loses connectivity. Web applications have come a long way since the days of Mosaic. Mobile Web applications have evolved even more. The days of WAP phones that only speak Wireless Markup Language (WML) are shrinking. Now you ask things of your mobile browsers that you don’t even ask of their bigger desktop brethren. Offline functionality is one of those features. The standards specified in HTML 5 go a long way to making it simple for developers to offline enable their mobile Web applications. In the next article in this series you will look at how another HTML 5 standard, Web Workers, can dramatically improve the performance of mobile Web applications.